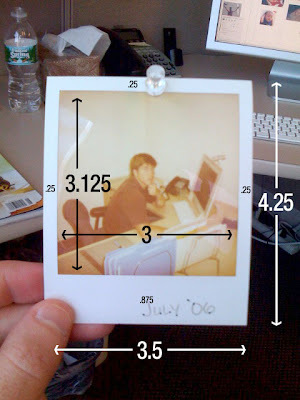 I was putting together a page in a magazine I'm designing that had a number of polaroid images 'thrown' about the page and I needed to know the dimensions because I wanted to create the art for it in InDesign. I googled it first and was looking and looking for the exact dimensions and then looked on my groovicle wall and saw a polaroid of my brother Patrick from '06. Duh, look right next to you dummy! Anyway, I figured somebody else could use this info if they didn't have a ruler and a polaroid staring them in the face everyday. Thank you, I've been looking on and off for two days. Excellent!! Thank you so much!! Can i be cheeky and ask for the depth as-well please?? Thanks a lot! I'm printing up magnets that look like a polaroid, and I was looking for the dimension to set up the art. Thanks for this, it's fantastic! Thank you so much! I'm working on an album for a wedding and was having a really hard time finding these dimensions. Ur pic was SUPER helpful! Thanks, again. Oooh! Thanks so much for this info! i'm doing a ten hour drawing project for my college art course over our thanksgiving break and i've decided to cut up matt board and make fake polaroids (with drawings inside)... i needed the dimensions and didn't have any photos handy. thanks for the info! Thanks...this is exactly what I needed to create a polaroid-type shot for our save-the-dates. Much appreciated! Wow, I'm glad this has helped a few people. Maybe I'll keep posting dimensions and other design related info. Awesome thanks so much. I love the internets! Awesome picture, this was exactly what i was looking for! wonderful...exactly what i was lookong 4, for the exact same reason! Thank you! By any chance do you know the dimensions of the black part on the back? Is it the same as the picture area on the front? Thanks for your work, I was looking for this info as well. Perfect! This was the exact thing i needed today! Thanks bunches! Cheers. You wouldnt believe the garbage on the net when you google for something basic like this. Salut!